Wild: Since arriving on the Island, I have encountered dozens of fascinating creatures whose behavior has never been studied or documented... and also sheep. Granted, Ovis arcam is quite different from the modern domesticated sheep - and even from wild sheep species such as Ovis orientalis. Domesticated: Some survivors have found herds of Ovis to be useful in farm life. Their thick wool can be repeatedly safely sheared with the proper tools, and cooked lambchops are a popular dish among some tribes, as is their hyper-nutritious mutton. Every now and then, a survivor with a sense of humor will attempt to utilize Ovis as a mount, since it can clamber up steeper inclines than many other animals. Although, the joke becomes significantly less amusing once their slow ride is run-down by a pack of Raptors. 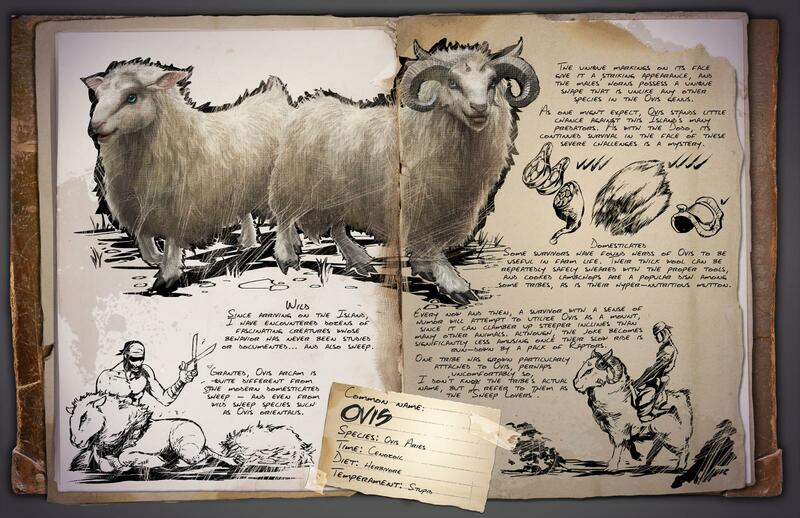 One tribe has grown particularly attached to Ovis, perhaps uncomfortably so, I don't know the tribe's actual name, but I refer to them as "The Sheep Lovers". Known Information: The unique markings on its face give it a striking appearance, and the males' horns possess a unique shape that is unlike any other species in the Ovis genus. As one might expect, Ovis stands little chance against this Island's many predators. As with the Dodo, its continued survival in the face of these severe challenges is a mystery.